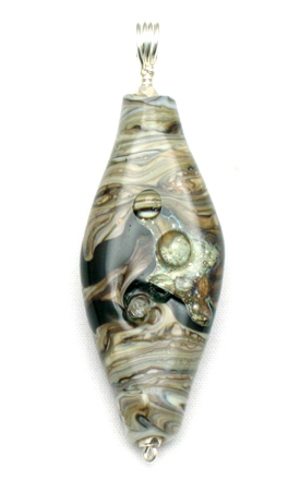 This flat, elongated diamond shaped lampworked bead is a complex combination of grey "fossil", dark opaque green, and ivory glass with accents of pure silver foil. The molten glass was manipulated with a pick and shaping paddle and, as a final step, dots of "magnifying" clear glass were added. This bead is both bold and subtle at the same time.